How to: begin making layouts ! Hello there! 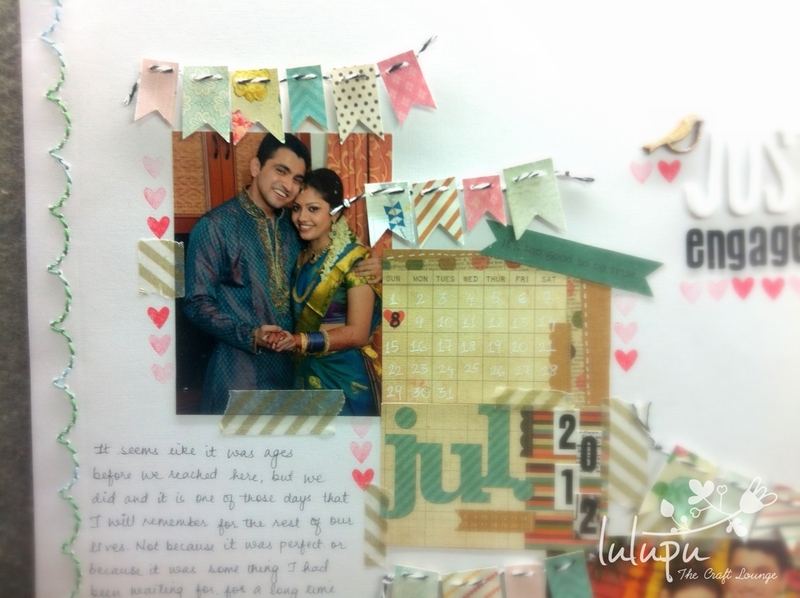 It's me Ujjwal today with an inspiration post for this month's challenge at lulupu. 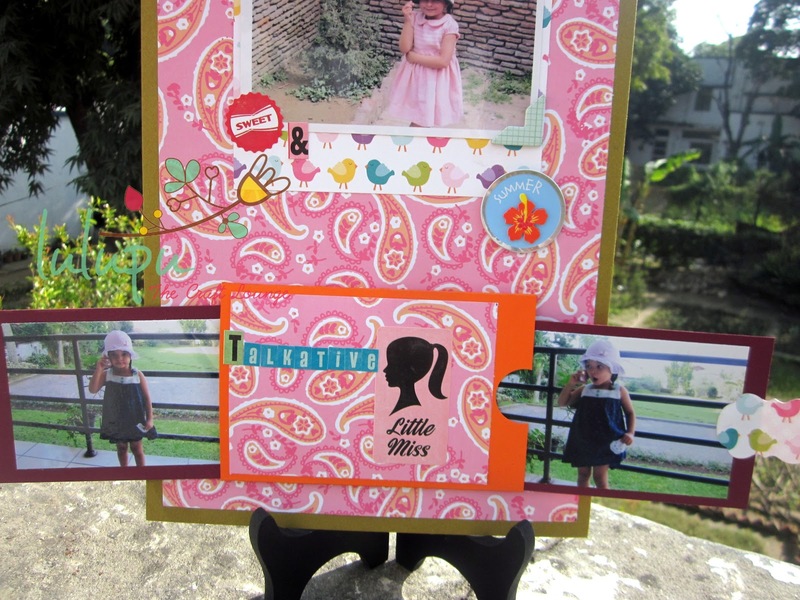 I know most of us are card makers here and we hardly venture into scrapbooking. 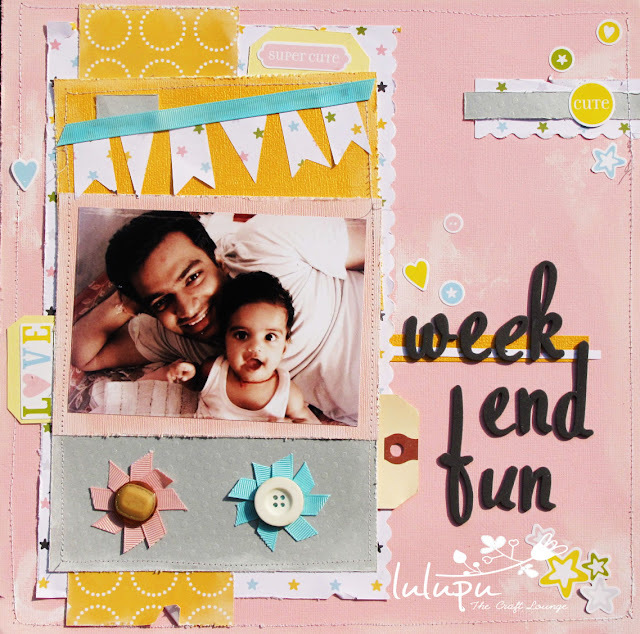 I am a beginner too but ever since my baby girl came into this world, I have been inspired everyday to make more layouts and preserve every little detail of her life. I thought I'd share today whatever little I know and do when I make layouts. I hope you will find this post helpful. The first step is always about choosing the pictures you want to scrap and there is no right or wrong here. Chose pictures that you like or that tell your favorite story. For today's LO, I picked up a picture of my daughter and my husband playing on a weekend morning. 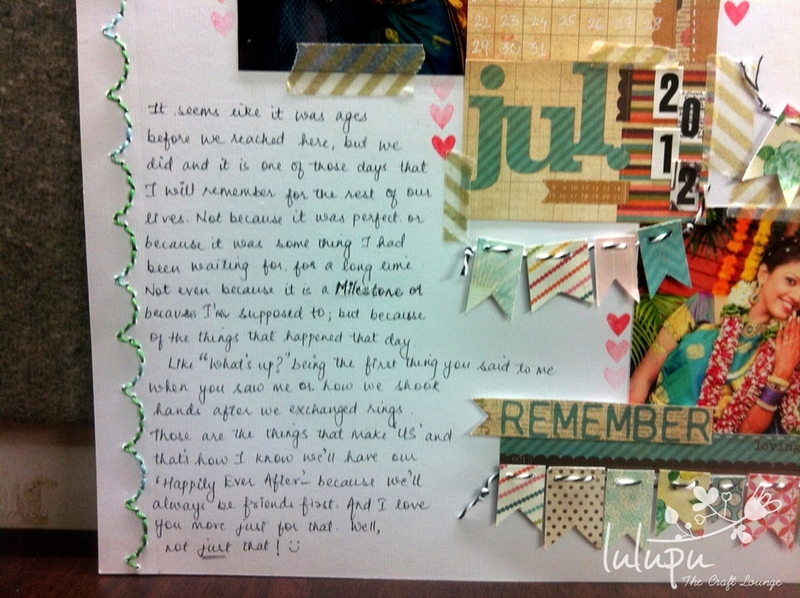 Remember scrapbooking is not just about preserving the pictures. It's also about preserving the story behind them. Don't be afraid to edit your pictures! Add a little effect using Photoshop or any other software you are comfortable with. Change the hues, crop, make them black and white. Just a little bit of editing can make your picture stand out. For e.g. I added a few effects and cropped the picture before printing it out and using it on my LO today. Your pictures don't have to be rectangular or square in shape all the time.Get creative and don't shy away from cutting your photos - use your circle punch, use your dies or cut out the figure outline just like Shruti did in her adorable layout HERE. So much fun! In today's world of digital photography, we do not often have photo prints with us all the time ready to go on the layout. There's nothing better than printing the photos from the comfort of your home as and when you want. But if you are like me, who do not own a printer just yet, you might find it easy to use an online printing service rather than visiting a printing studio. There are lots of online photo printing websites out there (you can use Google to get the idea) but I have had the chance to try two websites and I thought I will pass on my experience to you. Note: This review is based on my personal experience and in no way am I getting paid to say good and/or bad things about the two websites. The first ever online printing service I tried was zoomin.com and I was impressed. Great paper quality, Fabulous packaging, Fast Shipping(arrives the very next day most of the time). The best part is that they have photo editing options(lots of them) right on the website, so you can upload your pictures first and then edit them the way you like just before printing. Pretty Cool !! The second online printing service I tried was.itasveer.com and I wasn't that much impressed. Only good point was that they offer prints in 3.5X5 size which is not available at most of the other places. So you do have lots of options there! Pick the main colors such that they go with your picture, for e.g. in my layout below I picked the pink to be the main colors of my layout because that easily goes with the picture. 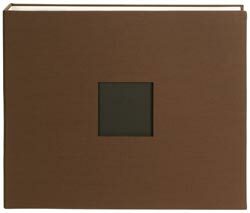 Almost anything and everything works on a neutral base(white, black, kraft, etc), so go with these when in doubt. It is always a good idea to start with a sketch. Make your own or pick one from one of the challenge sites like I did for my layout below. Use as many components from the sketch as you are comfortable with. For e.g. 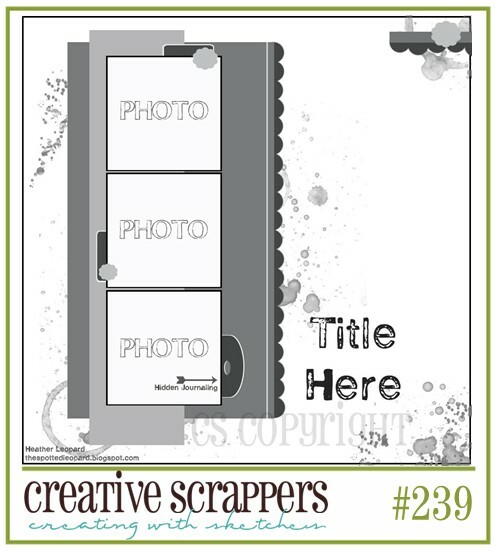 I picked the sketch from Creative Scrappers blog for today's LO but used only one picture instead of three. Buy ready made or make your own, add none or go crazy with them! There's no limit to this part! Remember you can incorporate almost all the techniques from card making into scrapbooking - stamping, paper piecing, stitching, misting, layering, embossing, distressing, punch craft - anything and everything you are comfortable with. I used distressing, machine stitching and layering as main techniques in my LO today. For embellishments, I created my own ribbon flowers but also used a lot of stickers from the kit. This is probably the hardest part mostly because we do this at the end and there are so many chances of going wrong with it. So there you have it - A few simple things to keep in mind when starting out to make a LO. Now that you have an LO ready, the next question is how to store it. I prefer storing my layouts in page protectors which are then tucked neatly inside the American Crafts D-ring albums. These albums are sturdy and the D-ring makes them lay flat on the surface when opened and allows pages to be turned with ease. Each album will store approximately 35-40 layouts and comes with 10 protectors(You can always buy more page protectors separately). Currently I am using this Chestnut cloth D-ring album to hold my baby layouts. 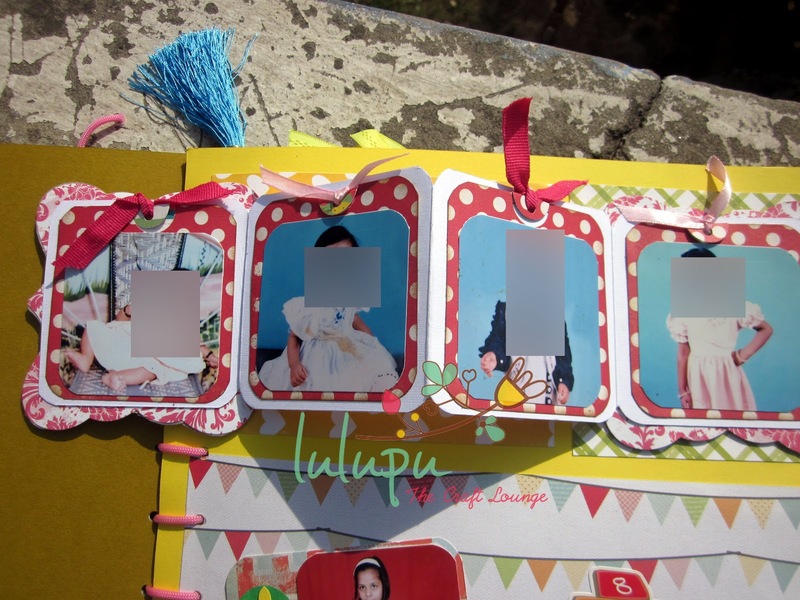 But if you do not want to spend on buying an album, you always have the option to make one from scratch (just like I did here) but I will still recommend you to buy page protectors. They will keep the layouts safe for a life time to come. Just a fun little layout of my daughter(6 months old today :)) and my dear husband, having some fun on a lazy weekend morning. Notice how I have used some effects on the picture to tone it down and make it look softer before getting it printed. 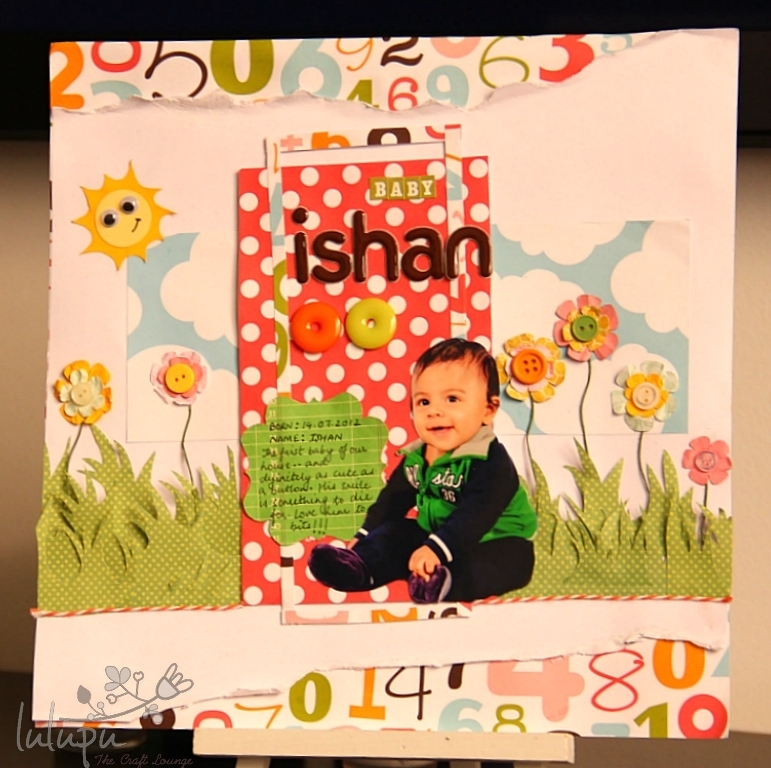 This layout was a piece of cake using this awesome American Crafts Baby Scrapbooking kit. + Always use products(papers, embellishments, etc) that are acid free and archival quality. You would want to keep the layouts safe for a long time to come. After all it's all about preserving memories. + Always use a photo safe glue when working with the pictures. I prefer using Tombow liquid glue linked below. + Store your layouts in page protectors always. 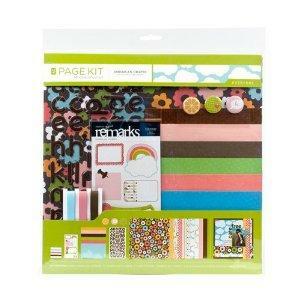 + If you are a beginner it's a good idea to invest in scrapbooking kits like THIS one. Kits make it easier as they are color coordinated for you. I hope you find this post useful and are inspired to create a layout and enter this month's challenge. There's still some time left. I am back with another post for this month. 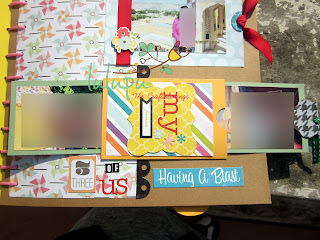 As you all know we are concentrating on layouts this month.The theme for the challenge this month is My favorite month of the year and more often than not ,in the favorite month of the year, we tend to click more pictures,but don't have space to accommodate so many pictures.....so what do we do? Should we use only one or two and abandon the rest of the pictures.Don't fret I am here to show you how to use maximum pictures in a layout. 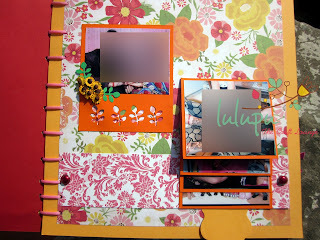 I use interactive elements on most of my scrapbook layouts.Here are some of the pictures to show the same. another version of explosion box to make a photo flap to hold more pictures. I am sharing a tutorial to make a double slider card to hold more pictures. Here is a glimpse of how it looks. I also have a video tutorial that will show you how I made this.. Thanks for passing by and for watching the video.Please feel free to ask any questions regarding the same. A few more days are left for you to make a layout and play along in our challenge.So please put on your thinking caps and link up your favorite month scrapbook pages. 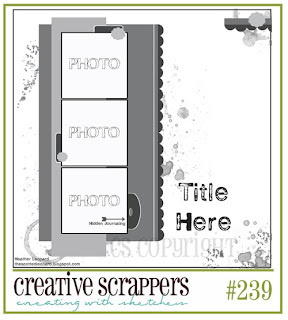 Today I am going to feature the American Crafts's 'Everyday' Scrapbooking kit and also talk a bit about Scrapbooking kits. A detailed look at all the gorgeous stuff available in this kit. 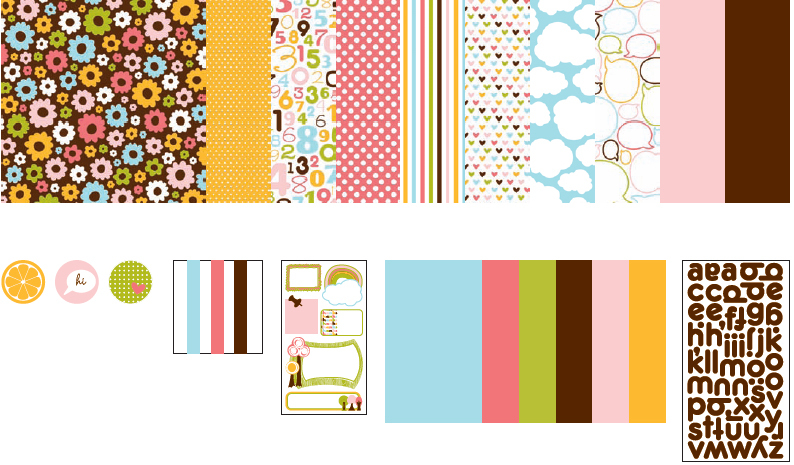 I am literally in love with this kit.. especially the pattern papers in it. If you had seen my previous layout you'll know what I did with that floral pattern paper from the kit. For those who have not, do check it out HERE. 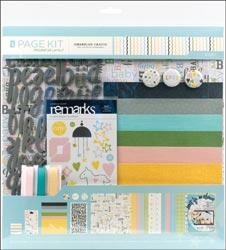 I believe Scrapbooking kits are best for those new at crafting and busy scrapbookers.. as they are very easy to work with. At times I get tired of searching for coordinating products when I sit down to make a layout, card, album or any other project.. but with kits like these your work just becomes easier.. especially when you are in a hurry to finish a project. So, here is what I made out of the kit..
That's my little nephew Ishan! Isn't he the cutest little person ever?! :) I outline cut out a photo of his and stuck it to the layout. I wanted it to seem as if he was sitting on a grass bed surrounded by pretty flowers, open sky and the sun smiling at him! 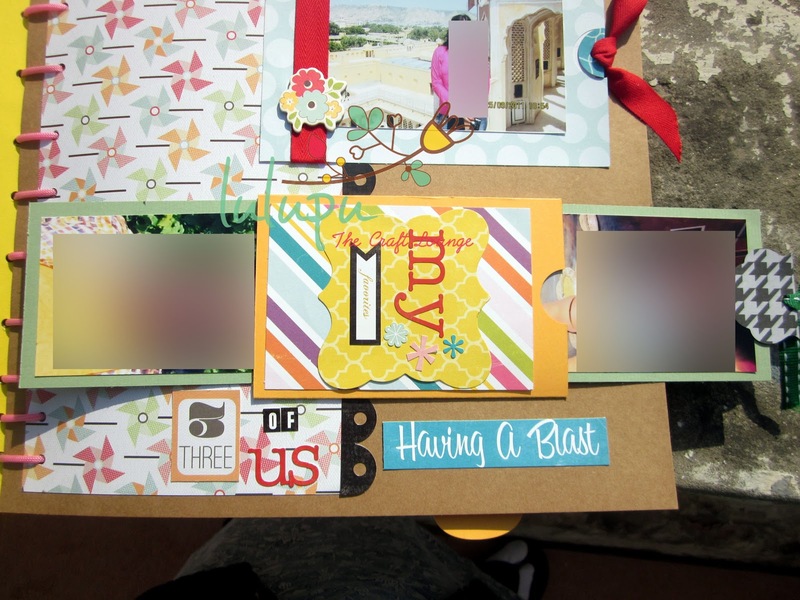 Here is a quick tutorial on how I put it all together..
Well there so much to this Scrapbook layout . 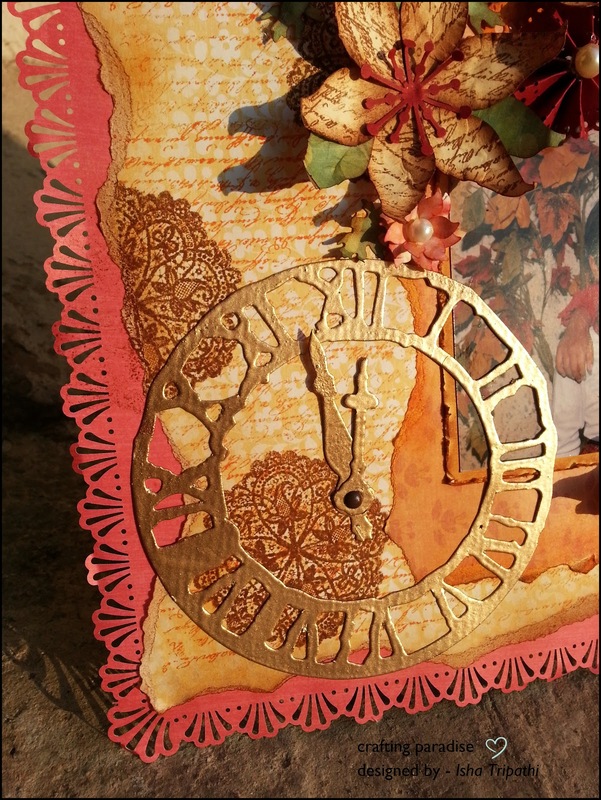 First of all i have used a Martha Stewart Deco shell border punch to cut my scrapbook paper ,pattern papers (PP) used is Hello Sunshine By Grace Taylor from Lulupu Store .. then i have done layreing ,distressing , stamping on the paper . 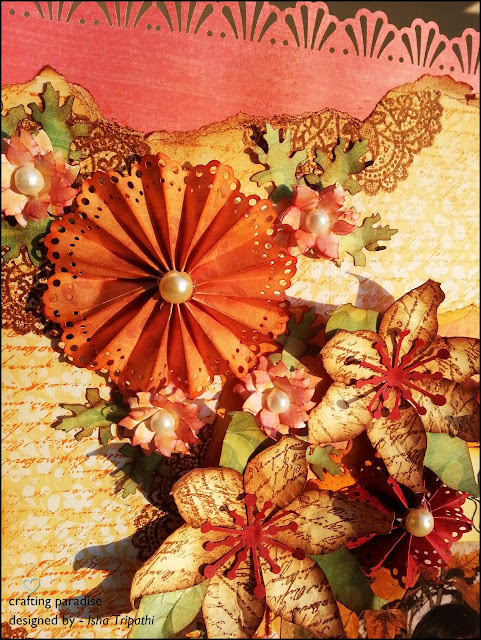 Now coming over to embellishment part ... i have used the pattern papers from same collection stamped, punched out the flowers and distress the edges, leaves as well. For rosette i have used a plain red color cardstock and punched the edges with Martha Stewart Doiley Lace Punch. For the flower centers i have used Flat Pearls as well. Flat pearls and ribbon locally purchased ." How are you all doing? 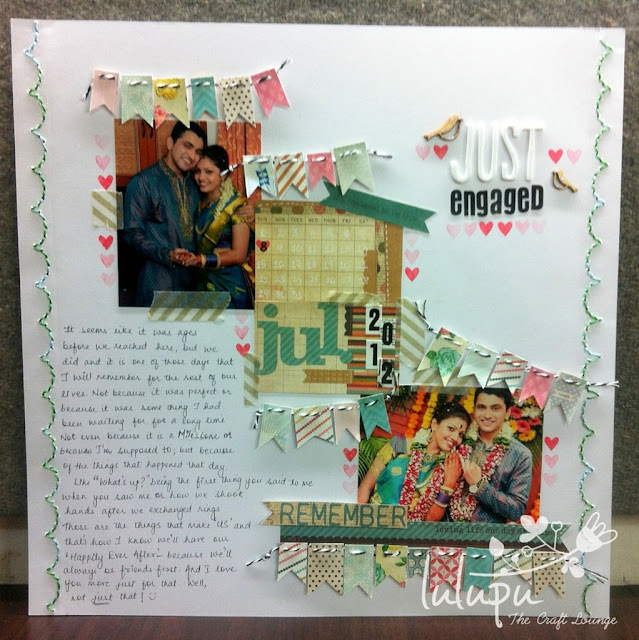 We at Lulupu are sure having fun creating all these wonderful scrapbook layouts to inspire you guys to make some of your own..
Its time to introduce to you one of our Guest designers of the month. 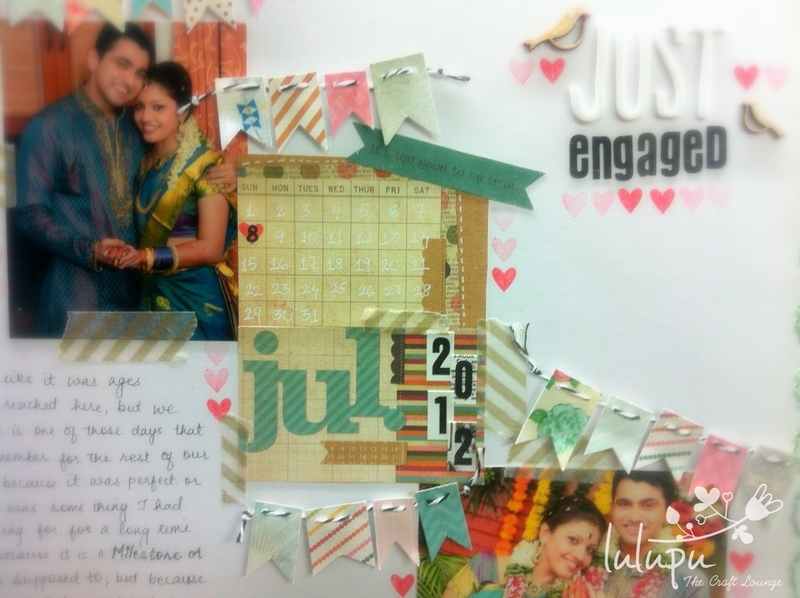 We want you to meet the lovely and super talented Lavina from http://lav-art-craft-food.blogspot.com/. She is here to share with us her take on this month's Challenge. "A very warm hello to all my crafty friends out there. I am Lavina from Mumbai right now staying in Melbourne. 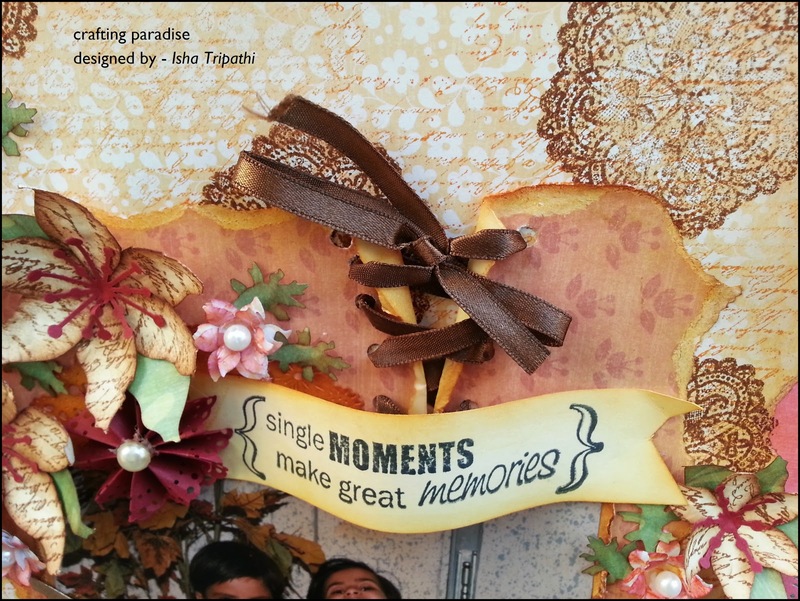 I just love to craft, mainly quilling on cards and photo frames. 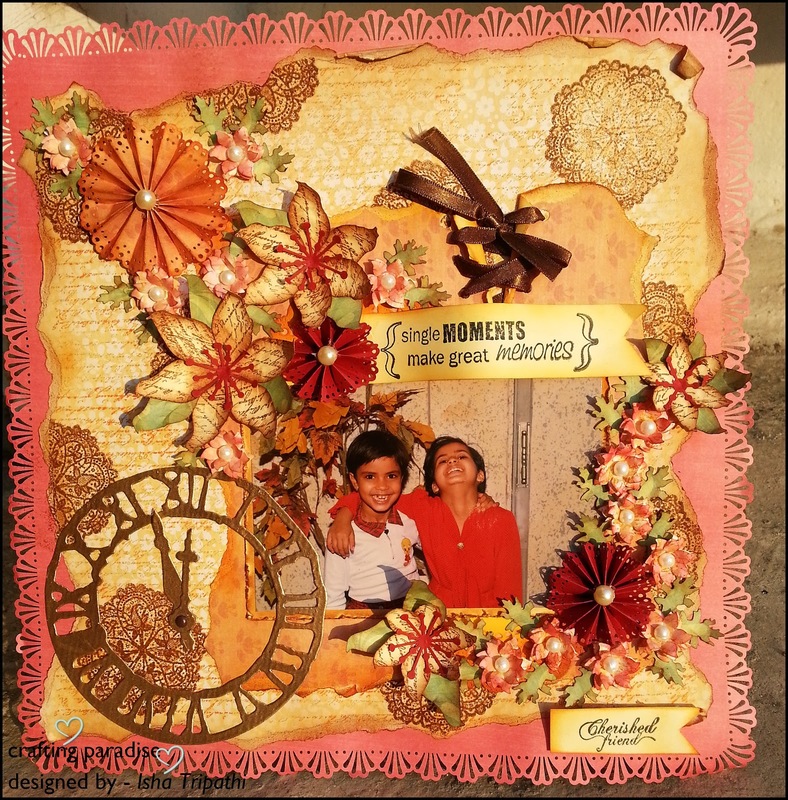 Scrapbooking however is in my genes! My dad loved to make picture books, which me and my brother would very fondly browse through. 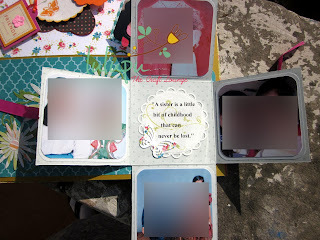 I just love to make the baby book which I am currently working on, hope someday my daughter will cherish it! 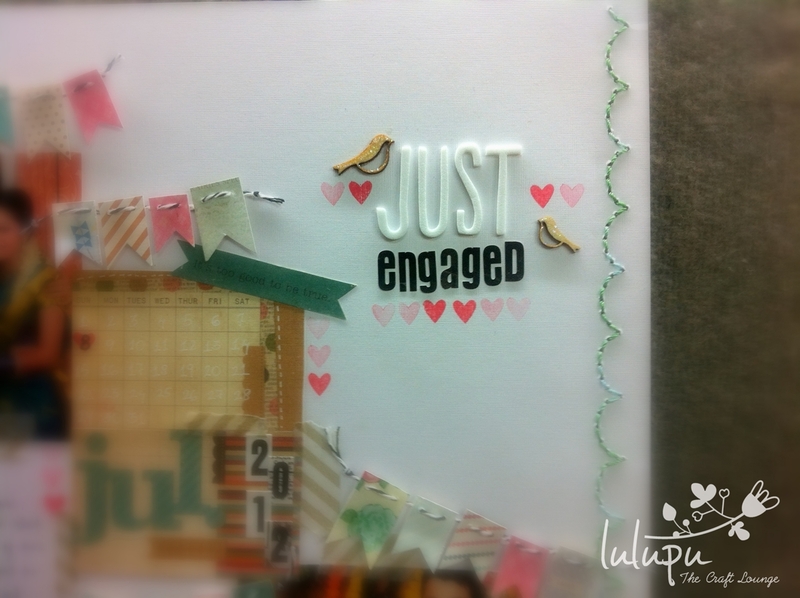 I am so excited to be the guest DT for Lulupu! Thanks dear Karuna and team for giving me the chance. I Love Diwali with all the colors and festivities involved, hence Oct-Nov are my favorite month. 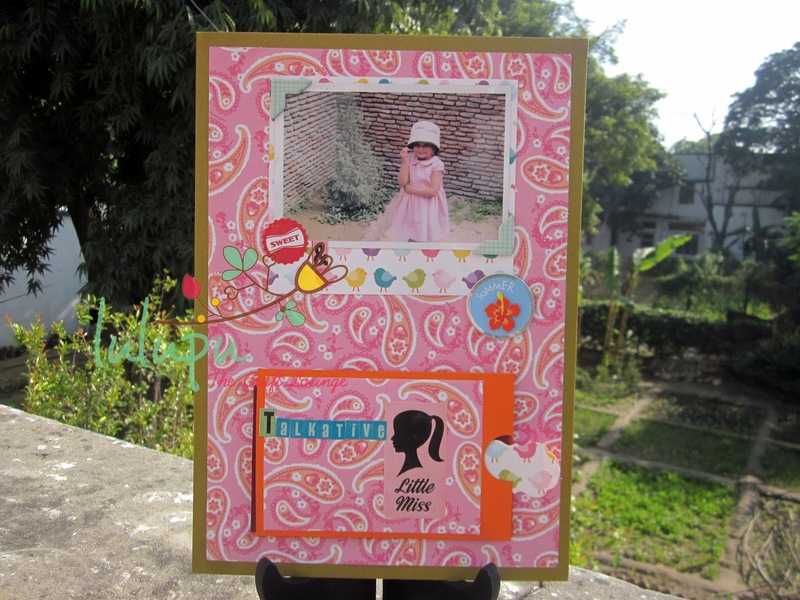 Made this layout to treasure the memories of my daughters first diwali. 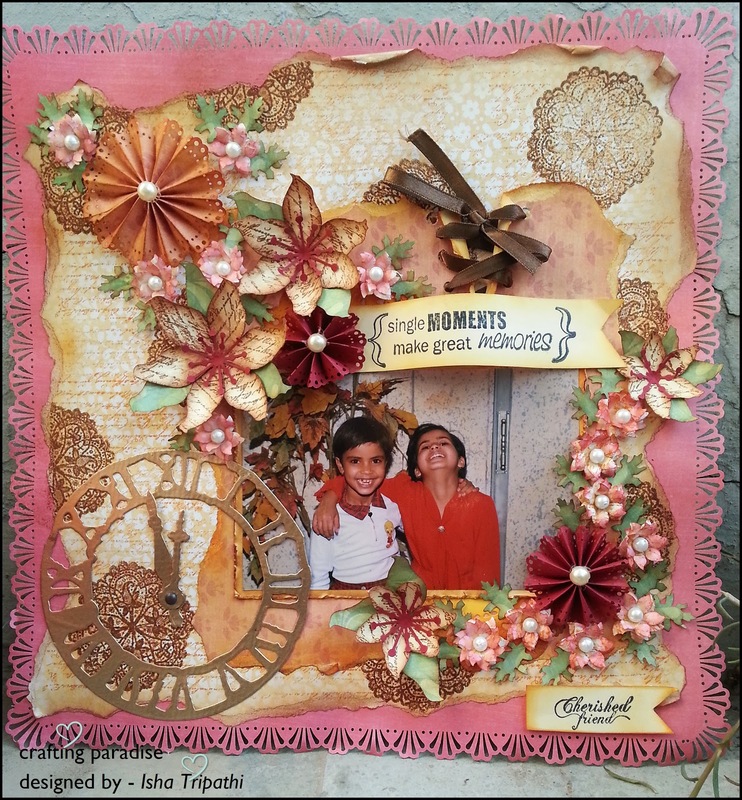 In this Layout, I have used all handmade embellishments except the alphas. I masked and misted the background using my punched flowers to give it an effect of sanskar bharti rangoli. 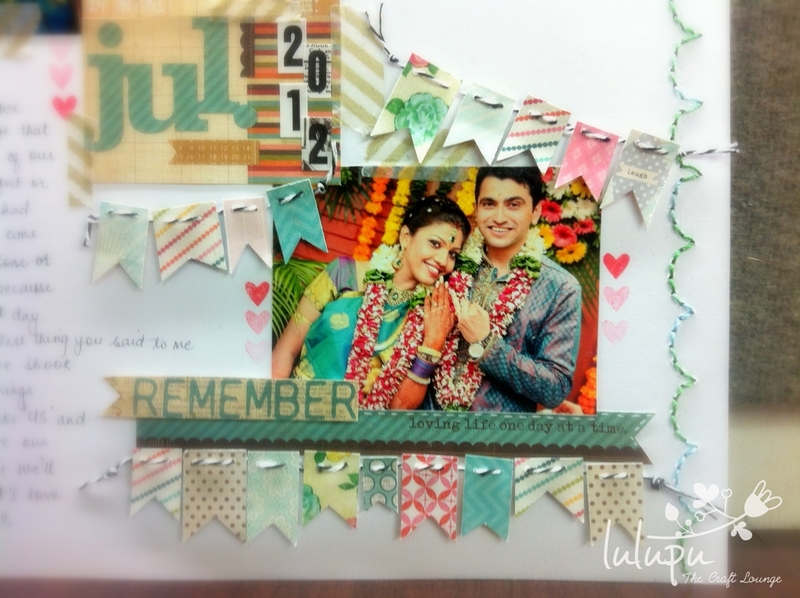 The green flowery frame around the photo is hand cut from double sided pattern paper. The alphabets are from my scrapbook kit. For the alphabet 'I', made some diwali crackers by making paper logs. I had seen these logs in many layouts, got the inspiration to use them as cracker from a quilling/crafting stalwart Suganthi, loved the idea. The lamp and the bunting is made using paper piecing technique.I stuck the bunting on the fold, to give it some dimension. Hope you like it as much as I enjoyed making it!" Thank you Lavina for inspiring us all with this special post! Welcome to a brand new month, a month that is, ironically, the last month of 2012. As a celebration of 2012 - which has been a great year for all of us here at Lulupu, we have decided to dedicate our posts to our favourite month in the year and create scrapbook layout. (See more details about our challenge here.) But then again, we don't like to keep our challenges simple. So we decided that we will embellish our layouts using patterned papers to the maximum and avoid ready-to-use embellishments. Here's what I decided to do. I took two pictures from that day and went crazy with patterned papers, literally. And because I wanted everything to be in sync, I chose a white background so that I could play with colours without having to worry about anything clashing. For me, the easiest thing with PPs is to create banners and I love them because they are easy to make, look really cute and you get to use your scraps!! How many times have we trimmed 6x6 papers to a smaller size? Too many! And that leaves us with strips of these beautiful papers - some 1/4", some 1/2", some wider. So I thought, why not put them to use? So I used some thin and some wide strips of numerous PPs and went overboard with the banners. But it gave me a colouful array of cute little embellishments on my page. I pierced two holes in each banner and joined them with black & white twine. I then mounted them on foam squares and dressed the whole page with it. Also, when I'm making scrapbook pages, I love a little stitching around the edges. So I used the Sew Easy - Scallop Stitch Piercer and stitched along the edges of the page. This is the top left corner of the page. You can see how I went crazy with the banners. I also used Washi Tape along the edges in some places just to make it look like it is the golden tape that is holding things in place. To the right of the calendar and again slightly lower, I added another picture (that now makes the whole arrangement a L-R diagonal) and added a few more banners and PP cut outs. Now that you have seen the page in bits and pieces, here's the whole page. 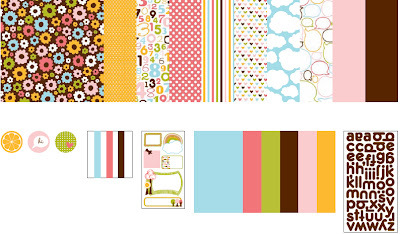 Noteworthy - For The Record Double-Sided Cardstock 12"X12"
MME - Indie Chic Citron Paper Pad 6"X6"
My Favorite month of the year 2012!